The NRC presentation reviewed their education and outreach activities on the SC Policy Statement (SCPS) and their participation in IAEA meetings to develop an implementation strategy for the IAEA Nuclear Safety Action Plan. The only new item was Safety Culture Trait Talk, an educational brochure. Each brochure covers one of the nine SC traits in the SCPS, describing why the trait is important and providing examples of associated behaviors and attitudes, and an illustrative scenario. It appears only one brochure, Leadership Safety Values and Actions, is currently available. ** A quick read suggests the brochure content is pretty good. The “Why is this trait important?” content was derived from an extensive review of SC-related social science literature, which we liked a lot and posted about Feb. 10, 2013. The “What does this trait look like?” section comes from the SC Common Language initiative, which we have reviewed multiple times, most recently on April 6, 2014. The illustrative scenario is new content developed for the brochure and provides a believable story of how normalization of deviance can creep into an organization under the skirt of an employee bonus program based on plant production. There were three licensee presentations, all from entities that the NRC has taken to the woodshed over SC deficiencies. Presenting at the RIC may be part of their penance but it’s interesting to see what folks who are under the gun to change their SC have to say. Chicago Bridge & Iron, which is involved in U.S. nuclear units currently under construction, got in trouble for creating a chilled work environment at one of its facilities. The fixes focus on their Safety Conscious Work Environment and Corrective Action Program. Detailed activities come from the familiar menu: policy updates, a new VP role, training, oversight, monitoring, etc. Rapping CB&I’s knuckles certainly creates an example for other companies trying to cash in on the “Nuclear Renaissance” in the U.S. Whatever CB&I does, they are motivated to make it work because there is probably a lot of money at stake. The associated NRC Confirmatory Order*** summarizes the history of the precipitating incident and CB&I’s required corrective actions. Browns Ferry has had SC-related problems for a long time and has been taken to task by both NRC and INPO. The presentation includes one list of prior plant actions that DIDN’T work while a different list displays current actions that are supposedly working. Another slide shows improvement in SC metrics based on survey data—regular readers know how we feel about SC surveys. The most promising initiative they are undertaking is to align with the rest of the TVA fleet on NEI 09-07 “Fostering a Strong Nuclear Safety Culture.” Click on the Browns Ferry label to see our posts that mention the plant. Fort Calhoun’s problems started with the 2011 Missouri River floods and just got worse, moving them further down the ROP Action Matrix and forcing them to (among many other things) complete an independent SC assessment. They took the familiar steps, creating policies, changing out leadership, conducting training, etc. They also instituted SC “pulse” surveys and use the data to populate their SC performance indicators. Probably the most important action plant owner OPPD took was to hire Exelon to manage the plant. Fort Calhoun’s SC-related NRC Confirmatory Action Letter was closed in March 2013 so they are out of the penalty box. Bottom line: The session presentations are worth a look. * RIC Session T11: Safety Culture Journeys: Lessons Learned from Culture Change Efforts (Mar. 11, 2014). Retrieved April 25, 2014. Slides for all the presentations are available from this page. ** “Leadership Safety Values and Actions,” NRC Safety Culture Trait Talk, no. 1 (Mar. 2014). ADAMS ML14051A543. Retrieved April 25, 2014. *** NRC Confirmatory Order EA-12-189 re: Chicago Bridge and Iron (Sept. 16, 2013). ADAMS ML13233A432. Retrieved April 25, 2014. 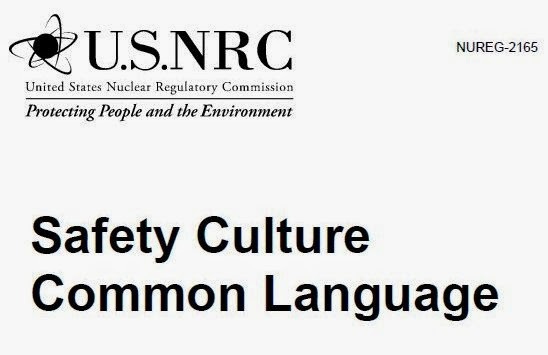 Two weeks ago we posted on NUREG-2165, a document that formalizes a “common language” for describing nuclear safety culture (SC). The NUREG contains a set of SC traits, attributes that define each trait and examples that would evidence each attribute. We expressed concern about how traits and attributes could and would be applied in practice to assess SC. Well, we didn’t have to wait very long. This post reviews a recent International Nuclear Safety Journal article* that describes the SC oversight process developed by the Romanian nuclear regulatory agency (CNCAN). The CNCAN process uses the International Atomic Energy Agency (IAEA) SC definition and attributes and illustrates how attributes can be used to evaluate SC. Note that CNCAN is not attempting to directly regulate SC but they are taking comprehensive steps to evaluate and influence the licensee’s SC. CNCAN started with the 37 IAEA attributes and decided that 20 were accessible via the normal review and inspection activities. Some of the 20 could be assessed using licensee and related documentation, others through interviews with licensee and contractor personnel, and others by direct observation of relevant activities. 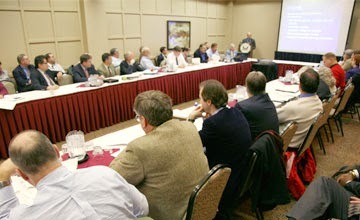 We reviewed a draft of the CNCAN SC oversight process on March 23, 2012. We found the treatment of issues we consider important to be generally good. For example, in the area of decision making, goal conflict is explicitly addressed, from production vs. safety to differing personal opinions. Corrective action (CA) gets appropriate attention, including CA prioritization based on safety significance and verification that fixes are implemented and effective. Backlogs in many areas, including maintenance and corrective actions, are addressed. In general, the treatment is more thorough than the examples included in the NUREG. However, the treatment of management incentives is weak. We favor a detailed evaluation of the senior managers’ compensation scheme focusing on how much of their compensation is tied to achieving safety (vs. production or other) goals. So, do we feel better about the qualms we expressed over the NUREG, viz., that it is a step on the road to the bureaucratization of SC evaluation, a rigid checklist approach that ultimately creates an incomplete and possibly inaccurate picture of a plant’s SC? Not really. Our concerns are described below. For starters, CNCAN decided to focus on 20 attributes because they believed it was possible to gather relevant information on them. What about the other 17? Are they unrelated to SC simply because it might be hard to access them? Ultimately the article can be summarized as follows: It’s hard, maybe impossible to directly evaluate SC but here’s what we (CNCAN) are doing and we think it works. We say a CNCAN-style approach may be helpful but one should remain alert to important SC factors that may be overlooked. 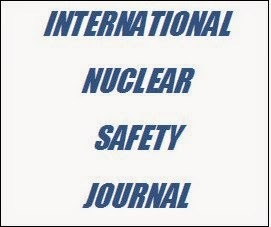 * M. Tronea, “Trends and Challenges in Regulatory Assessment of Nuclear Safety Culture,” International Nuclear Safety Journal, vol. 3 no. 1 (2014), pp. 1-5. Retrieved April 14, 2014. Dr. Tronea works for the Romanian nuclear authority (CNCAN) and is the founder/moderator of the LinkedIn Nuclear Safety group. ** NEI website, retrieved April 15, 2014. *** For an example, see our Jan. 30, 2013 post on Palisades. As most of our readers are aware General Motors has been much in the news of late regarding a safety issue associated with the ignition switches in the Chevy Cobalt. 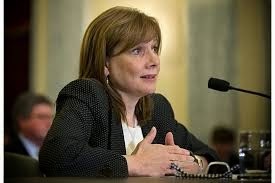 At the beginning of April the new CEO of GM, Mary Barra, testified at Congressional hearings investigating the issue. A principal focus of the hearings was the extent to which GM executives were aware of the ignition switch issues which were identified some ten years ago but did not result in recalls until this February. Barra has initiated a comprehensive internal investigation of the issues to determine why it took so many years for a safety defect to be announced. In a general sense this sounds all too familiar as the standard response to a significant safety issue. Launch an independent investigation to gather the facts and figure out what happened, who knew what, who decided what and why. The current estimate is that it will take almost two months for this process to be completed. Also familiar is that accountability inevitably starts (and often ends) at the engineering and low level management levels. To wit, GM has already announced that two engineers involved in the ignition switch issues have been suspended. But somewhat buried in Barra’s Congressional testimony is an unusually revealing comment. According to the Wall Street Journal, Barra said “senior executives in the past were intentionally not involved in details of recalls so as to not influence them.”* Intentionally not involved in decisions regarding recalls - recalls which can involve safety defects and product liability issues and have significant public and financial liabilities. Why would you not want the corporation's executives to be involved? And if one is to believe the rest of Barra’s testimony, it appears executives were not even aware of these issues. Well, what if executives were involved in these critical decisions - what influence could they have that GM would be afraid of? Certainly if executive involvement would assure that technical assessments of potential safety defects were rigorous and conservative - that would not be undue influence. So that leaves the other possibility - that involvement of executives could inhibit or constrain technical assessments from assuring an appropriate priority for safety. This would be tantamount to the chilling effect popularized in the nuclear industry. If management involvement creates an implicit pressure to minimize safety findings, there goes the safety conscious work environment and safety. If keeping executives out of the decision process is believed to yield “better” decisions, it says some pretty bad things about either their competence or ethics. Having executives involved should at least ensure that they are aware and knowledgeable of potential product safety issues and in a position to proactively assure that decisions and actions are appropriate. What might be the most likely explanation is that executives don’t want the responsibility and accountability for these types of decisions. They might prefer to remain protected at the safety policy level but leave the messy reality of comporting those dictates with real world business considerations to lower levels of the organization. Inevitably accountability rolls downhill to somebody in the engineering or lower management ranks. One thing that is certain. Whatever the substance and process of GM’s decision, it is not transparent, probably not well documented, and now requires a major forensic effort to reconstitute what happened and why. This is not unusual and it is the standard course in other industries including nuclear generation. Wouldn’t we be better off if decisions were routinely subject to the rigor of contemporaneous recording including how complex and uncertain safety issues are decided in the context of other business priorities, and by whom? Posted by Bob Cudlin 2 comments. Click to view/add. Work Backlogs are mentioned in a couple of specific areas so the overall grade is Minimally Acceptable. But we have one overarching concern that transcends our opinion of common language specifics. Our biggest issue with the traits, attributes and examples approach is our fear it will lead to the complete bureaucratization of SC evaluation, either consciously or unconsciously. The examples in particular can morph into soft requirements on a physical or mental checklist. Such an approach leads to numerous questions. How many of the 10 traits does a healthy or positive SC exhibit? *** How many of the 40 attributes? Are the traits equally important? How about the attributes? Could the weighting factors vary across plant sites? How many examples must be observed before an attribute is judged acceptably present? * NRC NUREG-2165, “Safety Culture Common Language” (Mar. 2014). ADAMS ML14083A200. ** Nuclear Safety Culture Common Language 4th Public Workshop January 29-31, 2013. ADAMS ML13031A343.